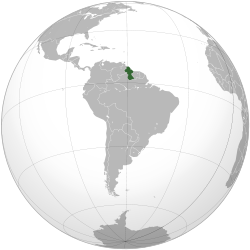 Guyana, offeecially kent as the Co-operative Republic o Guyana, an previously kent as Breetish Guiana, is a state on the northren coast o Sooth Americae that is culturally pairt o the Anglophone Caribbean. Guyana is a umwhile colony o the Breetish, Dutch an, for a brief period, the French. It is the anely state o the Commonwalth o Naitions on mainland Sooth Americae, an is forby a member o the Caribbean Commonty (CARICOM), that haes its secretariat heidquarters in Guyana's caipital, Georgetoun. Guyana achieved unthirldom fae the Unitit Kinrick on 26 Mey 1966 an becam a republic on 23 Februar 1970. ↑ "The World Factbook: Guyana". CIA. Retrieved 6 January 2014. ↑ 5.0 5.1 5.2 5.3 "Guyana". International Monetary Fund. Retrieved 18 April 2013. ↑ "GINI index (World Bank estimate)". World Bank. Archived frae the oreeginal on 9 February 2015. Retrieved 22 July 2015. Wikimedia Commons haes media relatit tae Guyana. This page wis last eeditit on 14 Mey 2018, at 06:33.